This is a large and brilliant statue of ancient egyptian god Anubis! this is a truly amazing piece and the winning bidder will be amazed with its magic and beauty! 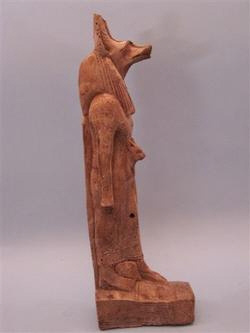 Anubis appears in a standing position.. Sekhmet and an Ankh are present upon his front as the pictures show. .made from stone ,during Dynasty 23, The detail is symbolic to the artistry displayed by the ancient Egyptian craftsmen. Purchesed from an antique dealer. We don't guarantee this items exact age as we don't have Carbon Dating,nor chemicle analysis Abilities. This is solely Due to high cost and possible damage to the items and the known fact carbon dating is done only on materials once living And therefore we can not verify the exact age time frame of this PIECE down to the exact Dynasty, year etc. For this reason we start with a low cost and with no reserve! I obtain my items from various well known and legitimate sources (antique dealers some of those dealers have been working in this business since 1930's and 1940's) private collections and or estates), We have received all information regarding our items from second hand sources, and the timeline set on our items is to be used as a guideline for the above period listed. Since I am a collector myself I tend to take pride in the items I aquire. These pieces are wonderfully preserved and we present them as they have been represented to us. The above listed item is from the New Kingdom Period(1539-1075 B.C.E.). This incredible "Striding Anubis" was carved from stone composite. We acquired this lovely piece from a select private collection and its provenance is from Luxor, Egypt. He is depicted in a Nemes headdress and has a long priest-like gown. 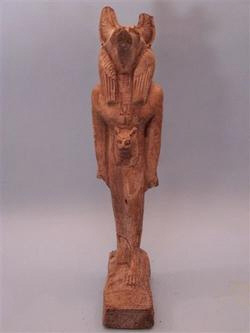 On the front of his body, there is a visible Ankh and a small Sekhmet goddess. There is a cartouche at his side with hieroglyphics covering the surrounding base. 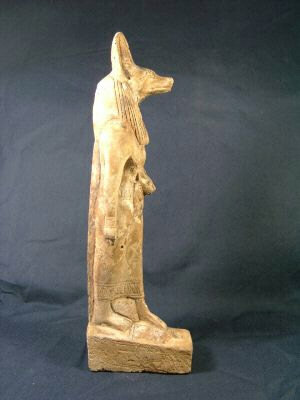 These type of Anubis figurines were usually found in tombs. He has part of his right arm missing otherwise, this item is intact with age wear. The reason for the item being available is due to the vast extent of old archeological findings, thousands of years in Egyptian burials and also the proliferation of these said items in private collections worldwide. 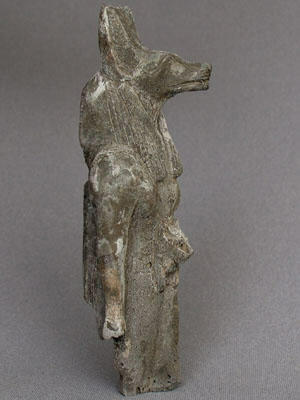 "On auction is a rare ancient Egyptian Anubis, Late Period(715-332 B.C.). 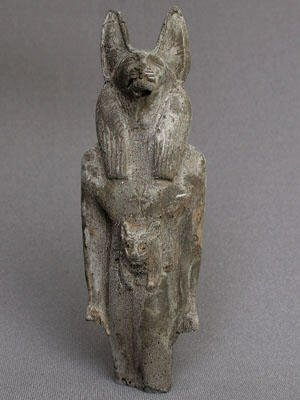 you can see a small Bastet on his body, We acquired this item many weeks ago from a private collection and it was said to have been found in Upper Egypt . This anubis is a funerary figurine that would have been dedicated and blessed by a priest, then placed in the tomb of the deceased. There is a faintly visible Eye of Horus on the front. Made of clay it is intact, has age wear and has traces of old green faience. This is one of a kind item and another one of this type will never be found! 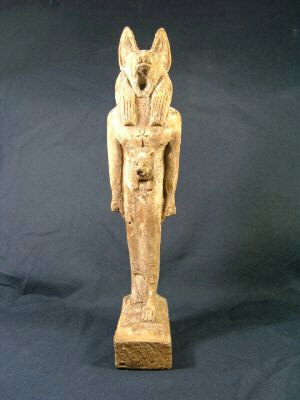 Don't lose the opportunity to gain this item for your ancient Egyptian collection!"